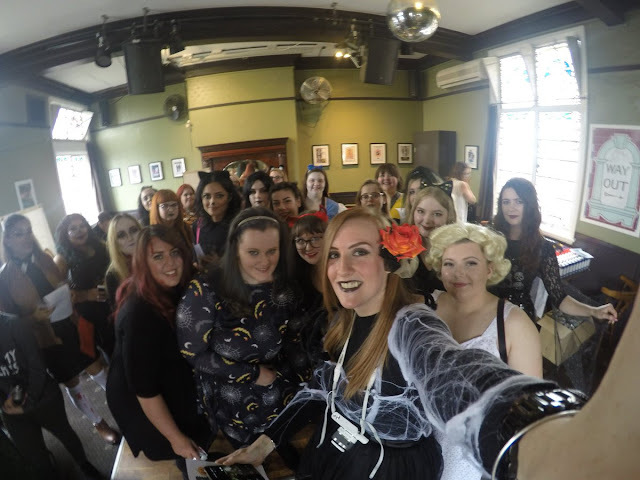 On Saturday afternoon a numerous amount of bloggers descended on the Rose Villa Tavern in Birmingham for the first ever Blogger Halloween Party, organized by Ashton (ashtonjade.co.uk) and Kirsty (kirstyleanne.com). I didn’t manage to take any photos with the lovely lot of bloggers however I have included some that others had taken there and credited them below! 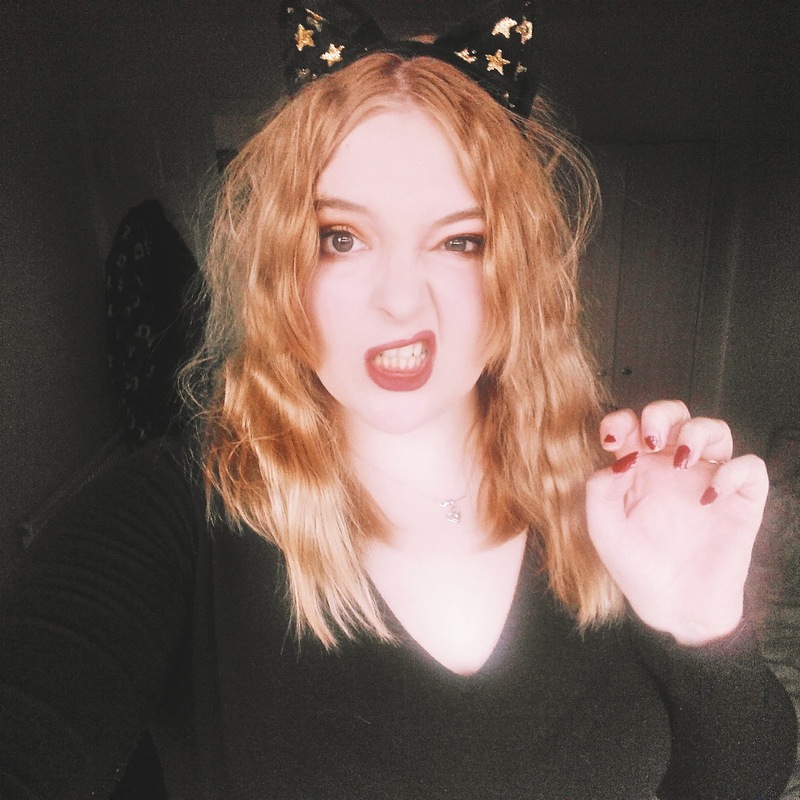 I went as a cat – duh! 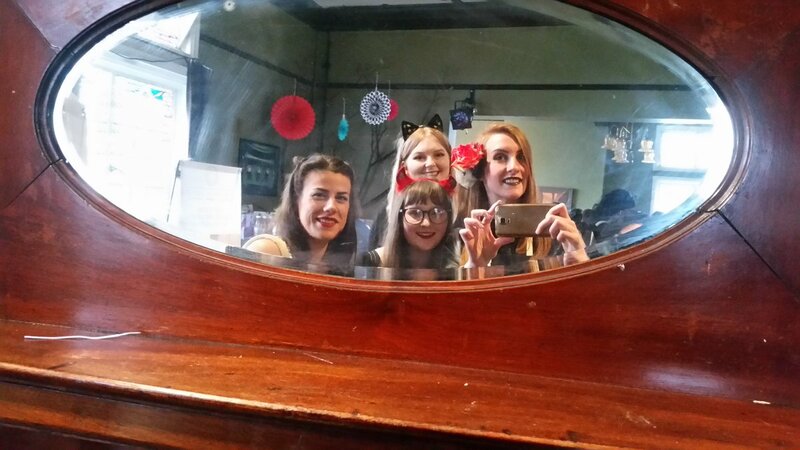 As it was my first ever blogger related event I was so nervous yet super excited at the idea of meeting new people and making new friends! And I 100% feel like I left with some new buddies in toe as well as generously huge bundle of goodies to try! We were there for 3 hours however it didn’t feel that long at all, time flew by so quickly and I didn’t want it to end. One of the stalls there was for a brand called Lumity, which is a food supplement brand aimed at combating the 9 causes of aging (cellilar debris, cellular energy decline, DNA damage, glycation, hormonal decline, inflammation, insulin resistance, oxidative damage and telomere shortening). They recommend using 3 of their morning softgels with 3 of their bedtime softgels. The morning softgels contain a mixture of nutrients and vitamins to help awaken you and kick start your immune system. The bedtime softgels contain a combination of flaxseed oil and amino acids, which help promote a deeper sleep and stimulate a release of HGH naturally. These tablets sound super amazing and I’d love to put these through their paces and give them a good go! If you’d like to know more about these amazing products you can check them out here. There was also an in-house competition where you had to design a pumpkin to win a mystery prize. And obviously I opted for a cat, however I do think I could of done a better job at colouring the background in though! This has got to be one of my favourite stalls there and this was for the brand GoodyFull. Who offer a subscription free, scheduled delivery of superfoods to your door! If you want to check them out and see what they have to offer, you can find them here. They also provided us with some treats to try that contained some of their products but were baked by the wonderful Mrs Mills Makes Cakes who can be found here. I tried the brownies and they were so melt in the mouth and delicious! Safe to say I will be checking out Mrs Mills website soon to get me some more. Lets just say, as soon as I saw this competition it got me rather excited to relive my teenage years where I had every colour of the rainbow at somepoint underneath my hair! 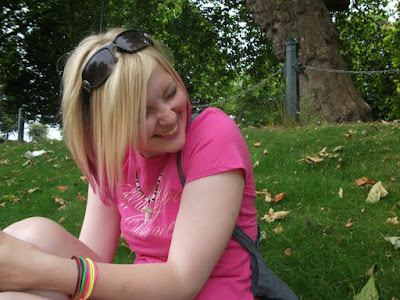 Will insert below a picture of me when I was younger sporting my pink hair in particular. The one that caught my eye the most was obviously the Pink Pizazz – girl likes her pink. I also could see on the boxes that you could either just use that dye by itself or use their pasteliser for a more subtle colour which sounded amazing! I will most definitely be looking at trying some of their products out in the future! If you wanted to check them out you can find out more about them here. They are also an exclusive to Superdrug which makes them so easily available. There was also another stall from Dr. Botanicals which offered a wide range of natural and vegan friendly beauty products for all skin types. I was spoilt for choice with just how many different products they had in their range, and they also had products for men which was superb as most skin products seem to be aimed at women nowadays. I could go into all of their products indepthly however I don’t want to ramble on so I will leave you with a link to their website here to discover more about them. The ladies there were so lovely and also gave us a complementary bag which was so nice of them! Now onto the goodies! While at the event we were given the choice of multiple drinks to try, there was enough for one each which was amazing so we got a wide variety! Firstly I picked up one of the Cherry Cola’s and one of the Cola’s from the Juicy Fuel range which were absolutely delicious. The Cola’s have no added preservatives or sugar and are 100% natural so make them good to drink both for taste and for your bodies. You can find out more about them here. Lastly, I picked up the lemonade and the fruit punch juice from The Berry Company. These drinks were aimed at kids but at 21 years old I thought these tasted amazing! They are a family run business in the UK who use fairtrade goodness in their drinks. You can find out more about them here. So pictured above is our amazingly generous goodies given to us in a lovely bag from jewellerybox.co.uk! As there was so many gorgeous products I decided to split them up into categories to photograph; beauty, health and skincare, food and stationary. One of my favourite things that were in the goodie bags was the VIP Blogger Pass for you to visit the West Midland Safari Park this winter! I love animals and this present was amazing and so so generous! I will be organizing this soon so keep your eyes peeled for a prize coming up for that. How gorgeous do these beauty products look! I cannot wait to try them out, especially the loreal lipsticks and the UBU brushes. The lip balms look amazing also, the mixstix from chapstick in strawberry and banana and the lipsyl cherry and almond. Also, can we talk about how cute the packaging is for the makeup sponge by flutter!? I’ve seen this so many times when I’ve been out and about and been lusting after it for ages, so I was so pleased when I found one in my goodie bag! Now onto body and skin products, I’m super excited to try out the Seba Med Clear Face Care Gel and the Swisse Hair Skin and Nails tablets to help keep my skin clear and my locks and claws looking in tip top condition! Food time! We were given one of the Goody Full powders to try out and I was so happy when I found out I got one of the Cacao Powders so I can try and make some yummy brownies like what were on display to try! I am also really intrigued by the Conscious Water flavouring which I cannot wait to try! Lastly, in the goodie bag was some treats from Wordery and Marco Polo which are so amazing, I love writing lists so the wordery pen and pad will come in super helpful. And I cannot wait to fill my travel journal full of exciting adventures with my fiance. I also took part in the raffle at the party and managed to win an amazing box from Little Bit Lavish which is a subscription box which can be found here. This box is night time themed and I am in love, it contains a pillow mist, moisturizer, bath salts, silk eye mask, lip balm and 3 sachets of Clipper tea which I cannot wait to try. Safe to say I can see all of these products getting used so much as I love a good nights sleep! 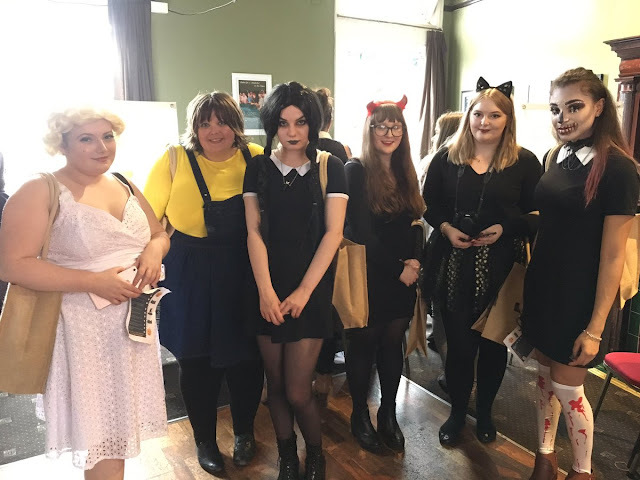 Well, that’s it guys for the Blogger Halloween Party post I am afraid, however after this first event I really was to start filling my diary full of loads of other fun events to attend! I’d love to thank the hosts Ashton and Kirsty for putting on an amazing event and say thank you to Jewellery Box, GoodyFull, Dr Botanicals, Colour Freedom, Lumity and all of the other brands involved. I'm so sad it's over! I need another event to go to ASAP. I am also so happy we got to meet on the train so neither of us were going to our first event on our own!